In a deteriorating economy, many Latinos have been adjusting their economic behaviors, including sending smaller remittances, curtailing spending plans and participating in informal loan agreements with family and friends. 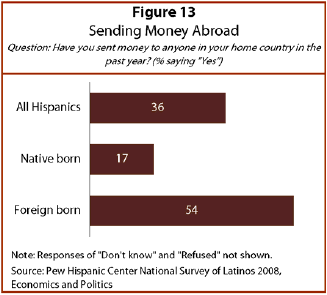 More than one-third (36%) of Latino adults say they have sent money to someone in their home country in the past year. as have more than half (54%) of the foreign born. The share of Latinos who say they sent remittances abroad is unchanged compared to 2006, based on results from the Pew Hispanic Center 2006 National Survey of Latinos. 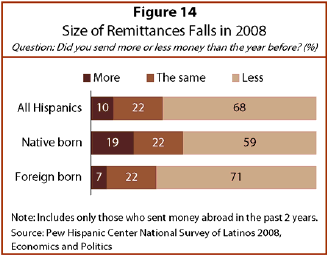 In 2006, 35% of Latinos, and 51% of foreign-born Latinos, said they had sent remittances in the prior year. The likelihood of sending remittances in the past year is independent of Latinos’ personal financial status. Among foreign-born Latinos who say their current personal financial situation is fair or poor, 55% say they sent money abroad in the past year. Among foreign-born Latinos who report that their personal financial situation is currently excellent or good, 52% say the same. While the percentage of Latinos who have sent remittances in the past year has remained unchanged from 2006, the amount of money sent abroad has fallen. Among Latinos who sent remittances sometime over the last two years, 68% say they sent less money in the past year compared to the year before. Among the foreign born who sent remittances in the last two years, 71% percent say they sent less in the past year than in the year before, while 59% of the native born say that. Though it is not associated with the likelihood of sending remittances, Hispanics’ personal financial situation is correlated with how much they send abroad. Among foreign-born Latinos who say they sent remittances in the last two years and whose personal financial situation is fair or poor, more than three-quarters (76%) sent less money abroad in the past year. 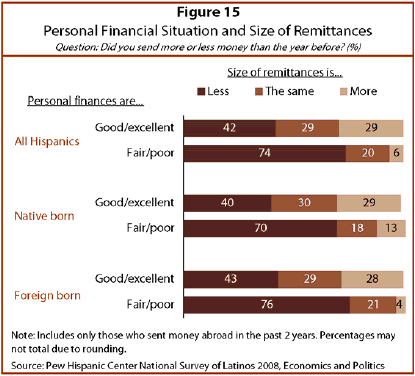 In contrast, among foreign-born Latinos who sent remittances in the last two years and who say their personal financial situation is excellent or good, 43% sent less money abroad in the past year. Among those who sent less money abroad, 73% cite financial circumstances as the reason for sending less in the past year than in the previous year. Among foreign-born Latinos who sent fewer remittances, 83% cite financial circumstances. Specific reasons mentioned by foreign-born Hispanics include less work or less income (43%), the economic situation (22%), having less money available (15%) and the rising cost of living (10%). Remittance flows are composed of funds transferred by individuals residing outside a country to individuals in that country. For Mexico and countries in Central America, these funds originate primarily in the U.S., the destination for the vast majority of migrants from those countries. According to central bank reports, remittances to Mexico and Central America increased rapidly from 2000 to 2006. However, growth has tapered off for most countries in the past two years. Mexico, the largest recipient of remittances in Latin America and the Caribbean, received nearly $24 billion in 2006, up from less than $7 billion in 2000. Growth came to a halt in 2007, when Mexico received virtually the same volume of transfers as in 2006. Current trends suggest that remittance receipts in Mexico in 2008 may struggle to match the level of receipts from 2006 and 2007. Guatemala, El Salvador and Honduras are the three largest recipients of remittances in Central America. Collectively they accounted for more than $10 billion in remittances in 2007. Growth in remittances also eased in 2006 for these countries. Honduras, however, is an exception in one regard—growth in transfers to that country picked up again in 2008. Data on the volume and growth in remittances in Mexico, El Salvador, Guatemala and Honduras are presented in Appendix C.
Almost half of Hispanics (47%) report that they delayed or canceled plans to buy a car or make some other major purchase as a result of the economic downturn. The foreign born are more likely than the native born to report adjusting their major spending plans. Half say they delayed or canceled plans to buy a car or make some other major purchase, compared with 44% of native-born Hispanics. A much larger share of Latinos report making adjustments in their day-to-day spending. Seven-in-ten Latinos (71%) report that they cut back spending on eating out as a result of the economic downturn. This is most prevalent among Latinos under age 55—75% of this group report cutting back, compared with 56% of people 55 or older. Latinos with children are also more likely to report this cost-cutting measure, compared with Latinos without young children—77% versus 65%. 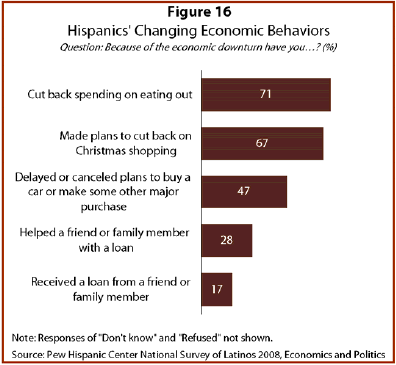 The economic downturn negatively affected the holiday spending plans of Latinos. More than two-thirds of Hispanics (67%) report that they planned to curtail holiday spending. This is especially true for Hispanics earning less than $30,000 annually (73%), as well as married Hispanics (71%) and Hispanics with children (74%). Foreign-born Hispanics are more likely than native-born Hispanics to say they planned to cut back on Christmas spending—70% versus 63%. The Pew Hispanic Center survey also explored how the economic downturn may have affected the prevalence of informal loans among Latinos. Informal loans are often an important alternative source of funds when individuals are unable to obtain loans through traditional credit markets. More than one-quarter of Latinos (28%) report that as a result of the economic downturn, they helped a family member or friend with a loan. One-third of employed Latinos (33%), Latinos with annual incomes over $30,000 (34%) and Latinos with at least a high school diploma (32%) report providing loan help to a family member or friend in the past year. One-third of Latinos ages 18-29 also report helping out friends or family; this share is significantly higher than the proportion of people ages 55 or older who provided assistance (23%). Nearly two-in-ten (17%) Latinos say they received a loan from a family member or a friend in the past year as a result of the economic downturn. Receipt of an informal loan was more common among younger Latinos than older Latinos. Almost one-in-four (24%) Latinos ages 18-29 say they received a loan, as do 20% of Latinos ages 30-39, 13% of those aged 40-54, and 8% of Latinos ages 55 and older. More than one-in-five (21%) immigrants who have been in the United States for 20 years or less say they received a loan from a family member or a friend in the last year. Half as many (10%) Latino immigrants who have been in the U.S. for more than 20 years reported receiving a loan from a relative or friend.